The Parador of Malaga is located on the famous "Costa Del Sol" of Spain. There are great views of the sea from the Parador which has a 'look-out' position over the city. It sits next to an centuries-old Moorish fortress (Alcazaba) and the Gibralfaro castle. In ancient times, there was kept lit a fire on this hill that guided the ships out at sea into the harbor of the city (this is how the name Gibralfaro came about; "gibral" = mountain, "faro" = light). The Parador of Malaga is surrounded by pretty pine trees and has extensive garden areas. There is a swimming pool on the top where you can swim and lounge with the incredible views. As well, each bedroom has it's own small balcony and views. The restaurant at Parador de Malaga offers a superb menu that specializes in sea food and typical Andalusian cuisine. 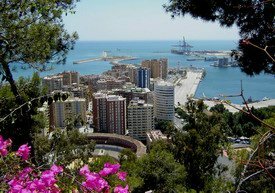 The city of Malaga is the gateway to the Costa Del Sol, but - if that's where you're headed - do stop awhile in this wonderful city and visit before moving on to the "sun and sand." Malaga has one of the busiest ports in Andalucia, fine golf courses and restaurants, and a host of things to keep travelers busy and entertained during their visit. The Moorish Alcazaba and the Gibralfaro. These are right near the Parador of Malaga and best preserve what remains architecturally of the once-powerful Moorish controllers of this city. Climb up on the old walls of the castle and get a great view out over the city. The new Picasso Museum (Picasso was a native son of Malaga). The city's central zone has some interesting churches and other museums worth visiting. The Alameda Principal is a great place to stroll and watch the busy Malagueños living their daily lives. Walk down to the Paseo del Parque and you'll encounter a very peaceful environment of tropical plants near the sea. El Palo and Pedregalejo is an area of quaint beaches with several restaurants and cafes that serve some of the very best fish and seafood meals anywhere in Andalucia. Rincon de la Victoria and the "treasure caves." Mijas is a pretty little "white village" in the hills above the sea - about 26 km from the Malaga Parador. Ronda is close, and one of the "must see" towns of Andalucia with its incredible gorge and Moorish ruins. Malaga offers a great mix for the visitor; the port and nearby beaches, quality museums, fascinating ruins, a world-class golf course - and the great Andalusian ambience. The Parador Malaga Gibralfaro is the perfect place to stay while visiting - you'll feel a bit like a king (or queen) from this perch that overlooks the entire city.